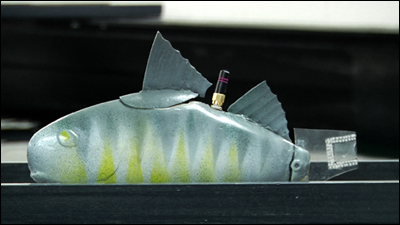 ECE/ISR alumnus Xiaobo Tan, an associate professor at Michigan State University, recently had his work on robotic fish featured as a Highlight on NSF’s “SEE Innovation” website. “Artificial Muscle-Enabled Robotic Fish” has resulted in innovative ideas for developing energy-efficient robotic fish, which could potentially revolutionize the way aquatic environments, drinking water reservoirs and aquafarms are monitored. Tan and his colleagues modeled, designed and constructed fish that use electro-active ionic polymer-metal composites (IPMCs) for locomotion. Similar to muscle tissue, the IPMCs change shape when a voltage is applied. The fish fins are integrated with a control system to provide the robot with energy-efficient, fish-like maneuverability. Tan has partnered with zoologist Elena Litchamn at MSU's Kellogg Biological Station to explore monitoring applications in ecosystems. The team foresees using the fish as an environmental data collection platform by adding communication, navigation and environmental monitoring sensors. In addition,the robotic fish were featured on Bloomberg.com. Tan earned his Ph.D. in Electrical Engineering in 2002 and was advised by Professor John Baras (ECE/ISR) and Professor P.S. Krishnaprasad (ECE/ISR).